Police minister Vernon Coaker has apologised for telling Parliament that 70 officers were injured dealing with protests at Kingsnorth power station. His comments came after it was revealed that injuries sustained during policing at the Climate Camp in August included insect stings and heat exhaustion. There were only 12 reportable injuries, according to a Freedom of Information (FoI) request by the Liberal Democrats. More than 1,000 officers were involved in policing the event near Hoo in Kent. According to information obtained by the Liberal Democrats, Kent Police officers and staff suffered only 12 reportable injuries, four of which involved direct contact with another person. Unless the protestors are to be held responsible for wasps and the weather, aren't we to conclude that the justification used at that time was wholly bogus and vacuous? The Lib Dems said the eight other injuries included being "stung on finger by possible wasp", "officer injured sitting in car" and "officer succumbed to sun and heat". Kent Police confirmed that 12 officers were required to retire from duty because of their injuries. A spokesman said: "In total, approximately 68 officers were treated for injuries or illnesses by the Kent Police tactical medicine unit and the Red Cross. "In addition, teams of officers from other forces brought their own first aid support who would have also dealt with injuries." "Other than the 12 who had to retire from duty, the remaining officers with injuries or ailments did not need to do so." Mr Coaker said an inquiry was being carried out by the National Police Improvement Agency (NPIA) into the handling of the demonstration. He added: "I was informed that 70 police officers were hurt and naturally assumed that they had been hurt in direct contact as a result of the protest. "That clearly wasn't the case and I apologise if that caused anybody to be misled." David Howarth, Liberal Democrat justice spokesman, urged Mr Coaker to "revise his conclusion" that the policing was "proportionate and appropriate". David Taylor, Labour MP for NW Leicestershire, said: "When people expressed concerns about the vigour and resources devoted by the police to the Kingsnorth climate camp we were told that it was justified because there were dozens of injuries that occurred." He added: "Unless the protestors are to be held responsible for wasps and the weather, aren't we to conclude that the justification used at that time was wholly bogus and vacuous?" Kent Police assistant chief constable Allyn Thomas said: "Considering the scale of this operation, which involved around 1,400 officers and staff, the very small number of injuries sustained by officers is actually very positive news. "Officers are duty-bound to report any injuries or illnesses while they are working so all ailments, however minor, will have been recorded in a basic format for this purpose. "We consider it a measure of the success of the whole policing operation that so few injuries were sustained, both by officers and protesters, and that none were serious or major." Discretionary powers to allow officers to stop and search people were extended to the whole of the Hoo peninsula during the protest against the building of coal-fired power stations. Of the 100 people arrested, 46 were charged with offences ranging from obstruction and public order offences to the possession of a bladed weapon. 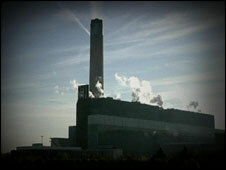 The current Kingsnorth power station is due to close in 2015 and E.ON wants to replace it with two new coal units, which it claims will be 20% cleaner.